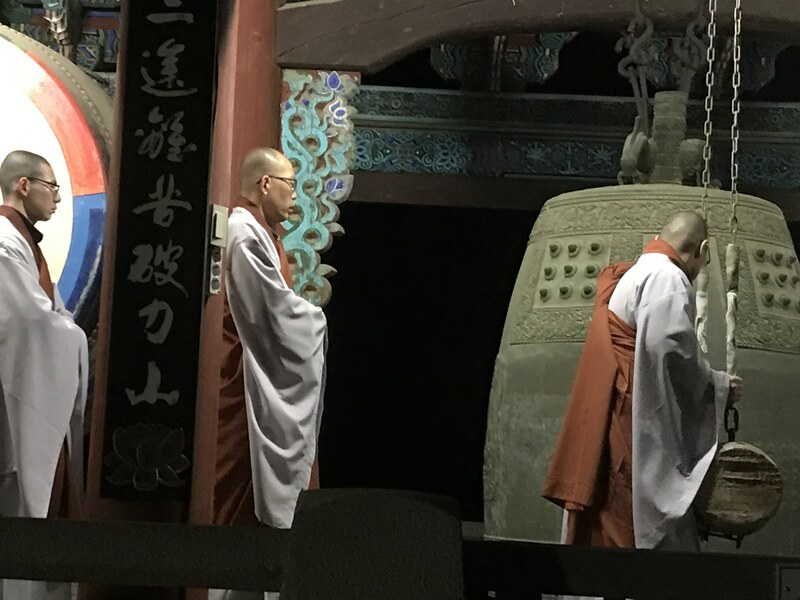 Four monks in white robes and rust-red vests arrive at the small pavilion where we have been waiting and, for ten minutes, we watch them take turns pounding on a six-foot drum. The rhythms are exciting and powerful, and a little dissonant to our western ears. The drumming stops and the monks take turns ramming a log into the side of a giant brass bell. The sound of the bell resonates in surprising ways and the vibrations echo through me, somewhere deep. My shoulders relax and I stop feeling the cold. 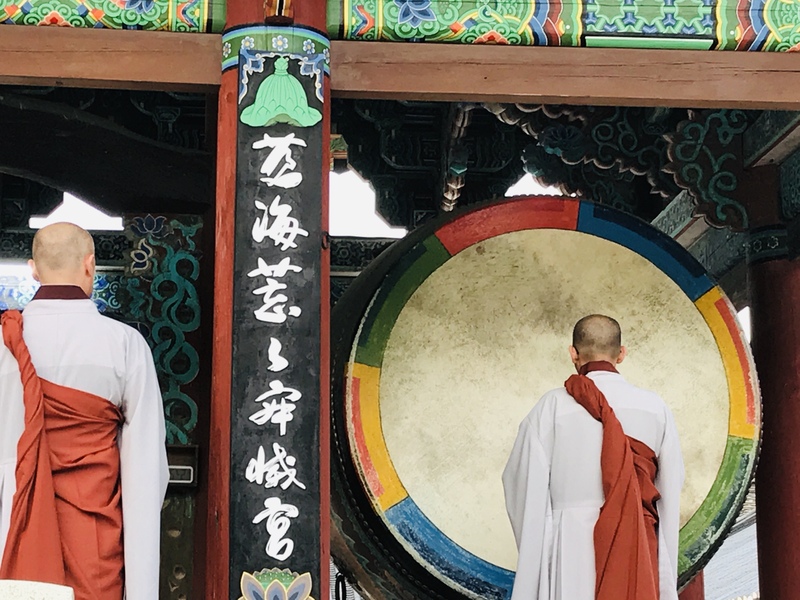 When the drumming stops, our host, Bori, tells us the sounds of the drum and the bell are not designed to appeal to our intellect (“monkey mind”) or hearts (with their unpredictable emotions) but to our bellies, centers of balance and quiet. And then we walk to the unheated temple for chanting and a dozen prostrations before three giant Buddhas sitting on a cloud of live orchids. Breakfast follows in an unheated dining hall. The food is vegan with the traditional Korean palette of sour and musky and salty. Kim chee, tofu, rice, vegetables. No garlic or onions. No fats, no fruits, no caffeine. I am a vegetarian so this is not tough for me. I leave the dining hall craving ice cream. Trailhead from outside our accommodation. 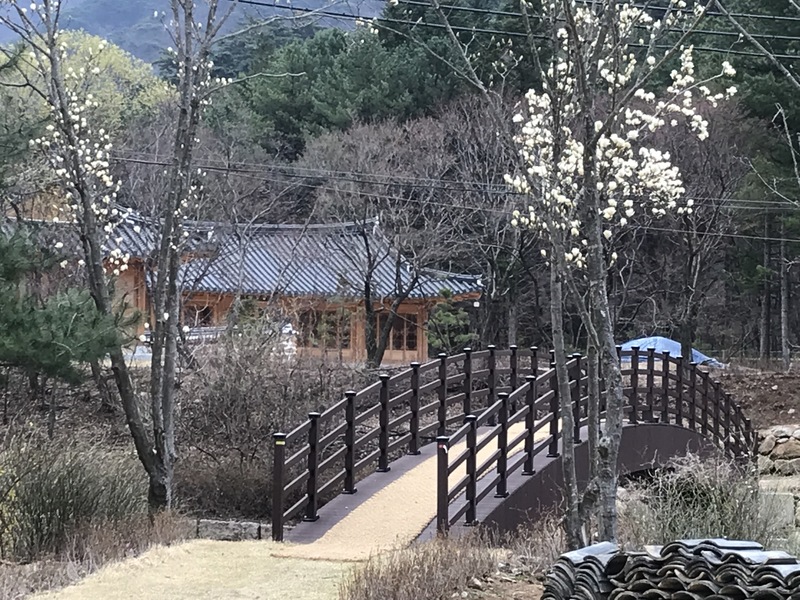 Beopjusa is in Songnisan National Park. The morning’s rituals will be repeated in the afternoon, following a hike into the gorgeous hills and a period of rest on the mats in our tiny (heated) sleeping room. Personalized clay tiles for the temple buildings. The second day is like the first, except our meals include watermelon and grapes, and I take the time to honor a friend of the family who has left us. I say her name to myself during the morning chanting. 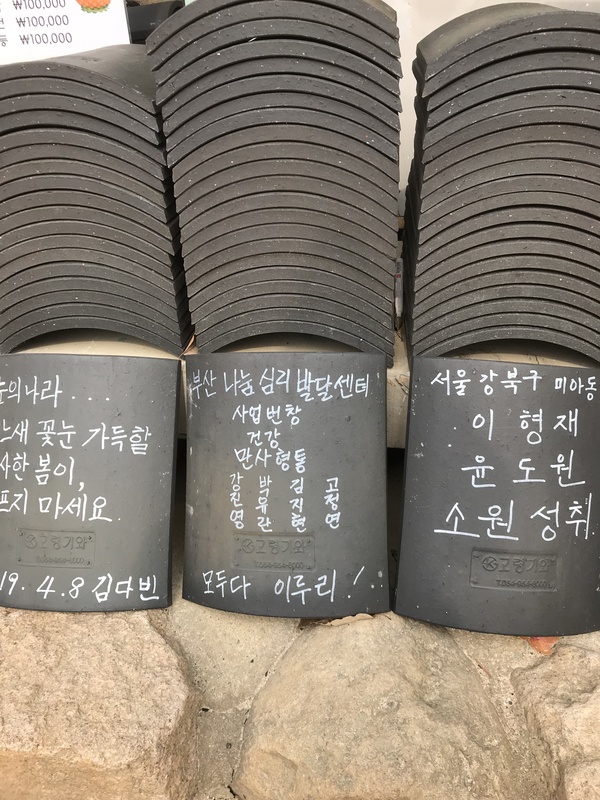 I light a large candle and paint a black roof tile with a goodbye message. I realize how glad I am to be at the temple right now, where there are so many small ways to honor her memory. At the end of our visit to Beopjusa Temple, we feel healthy and relaxed. The world seems quieter and strangely comforting. We will eat ice cream. Beautiful photos and descriptions, Kim. Thanks so much! Hope you are up and about again! thanks for sharing this and other experiences…adventurous traveler! I can vicariously enjoy the experience….and almost felt those deep vibrations of drums and giant bell…..saludos and buen viaje amiga ! Looking forward to reading about your big event! My only associations with this experience of yours are the film “sporting, summer, fall, winter spring”, and an hour or two I spent in a Tibetan monastery in southern India. Where you get the energy to keep doing all this roaming about, I can’t imagine, but i sure love reading your posts. Keep it up while you still can! Mesure that’s where you get the energy, comme to think of it. Wonderfully conveyed sense of sensations and experiences, Kim. I loved this report, especially as I had signed up to visit a monastery in Koyasan for 2 nights but cancelled as it was right after I had done the hard bike ride (almost getting blown off my bike) so knew that the cold would not be my cup of tea, but hope to go back some year. I’ll be curious to see what you think Japan vs. Korea. 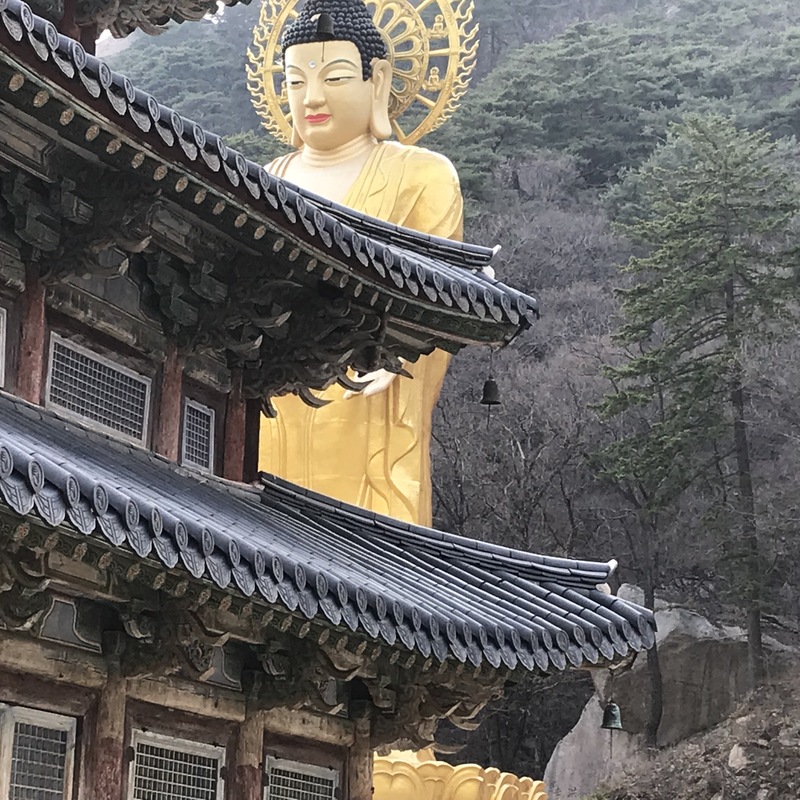 I’ve met several folks in Japan who had visited Korea or were from there and it’s moved up on my bucket list! 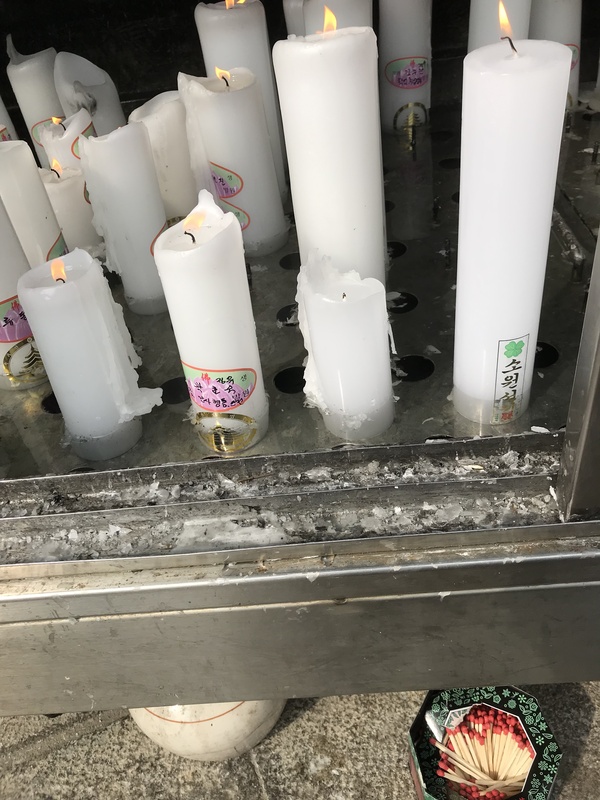 OMG, so wonderful to be back here in Hawaii but am dealing with some mentally ill folks next door….I saw maybe one homeless person the entire time in Japan while the Bay Area has 22,000….besides vets etc, what the hell is so deeply disturbed about American culture? Just called CPS on a neighbor….makes me so sad to see these kids suffering because of their parents. Yes, Karen, we too are wondering where the US went wrong with respect to human dignity. There is poverty here in Korea but not a lot compared to the US and I have read that there is no homelessness. I love you so much! And I’m hoping that your birthday tomorrow which is already probably here in S. Korea is as wonderful as you are and full of all the ice cream you deserve to have. Kim, I loved this multi-sensory story of cultural differences, surprises, and your honest reactions. Your photos are wonderful, too. What flavors of ice-cream have you discovered? Green tea of course! Also, there is a flavor here called “sobok” that is made from several types of grains. The first bite was kind of annoying — like eating toasted bitter rice — but after that it was great. Oh Green Tea, one of the world’s best! 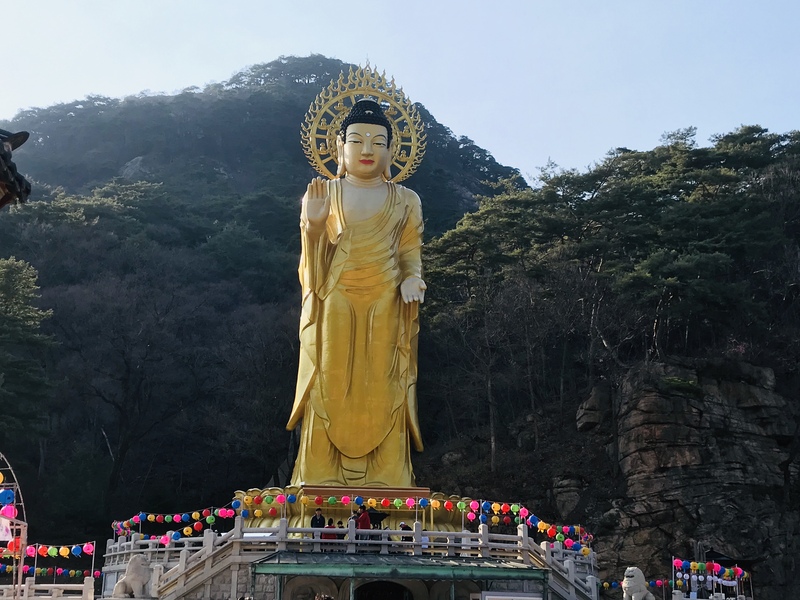 When you get back to Seoul, you might want to check out one of the temple food restaurants. I had the most amazing meal at one. I believe it was Sanchon. 4 courses, beautifully displayed, yummy. All vegetarian like you described in your story. I love following your travels. 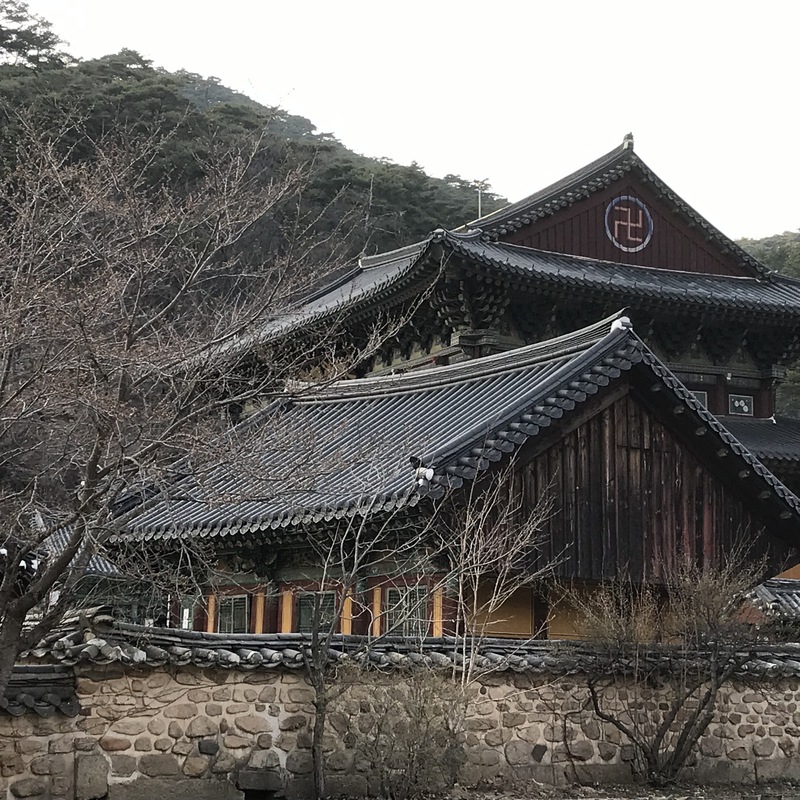 We are (sadly) not returning to Seoul but we will look for temple restaurant in Busan or Gwangju!